Avast ye, mateys! Lower the sails and drop the anchor. We approach a new land. Aye aye, captain! 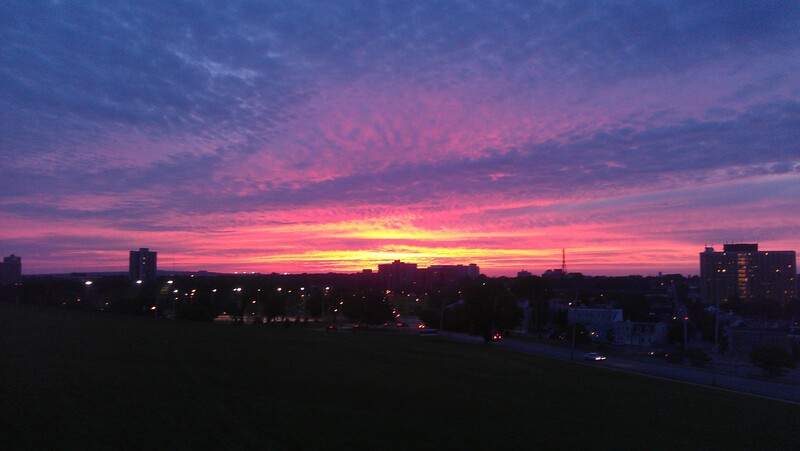 Though we did not land in the port city of Halifax, we did spend a few days there. Anya’s friend Hamdi showed us the multitudinous ice cream and drinking establishments. 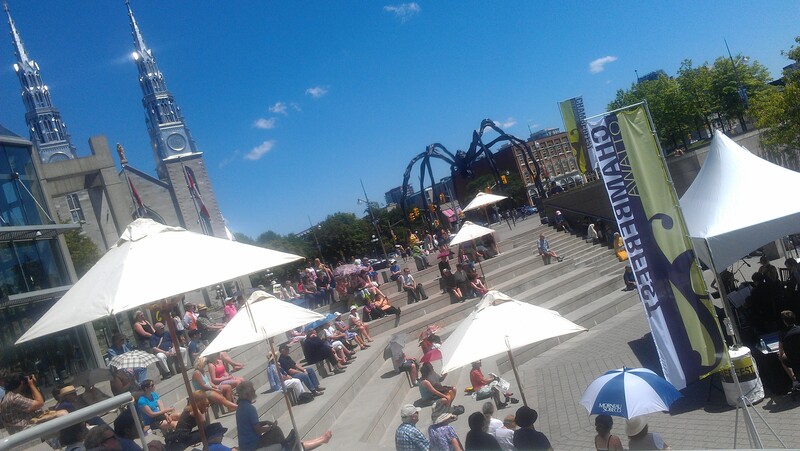 We also went for a stroll along the vibrant waterfront boardwalk. We even explored the Halifax harbour on a 30-foot sailboat, circling around Georges Island. The island has a fort and many, many snakes. We are told that an underground tunnel connects the island’s fort to the Citadel, which towers over Halifax. It was time to replace our chains again, and we stopped by the Bike Pedaler bike shop in Dartmouth. The shop is involved in promoting cycling culture. For example, they have free bike parking for anyone working in downtown Dartmouth. The shop owner, Marc, told us about an unfortunate new law that has aggravated cyclist-driver relations: drivers must give cyclists 1m distance when passing. The law is not enforced and cannot be regulated: even evidence like helmet camera footage cannot be used in court, although some have tried it. With the passing of the law, drivers feel like they’ve had some privileges taken away from them and now drive more aggressively, giving cyclists even less space when passing them and generally being unfriendly. 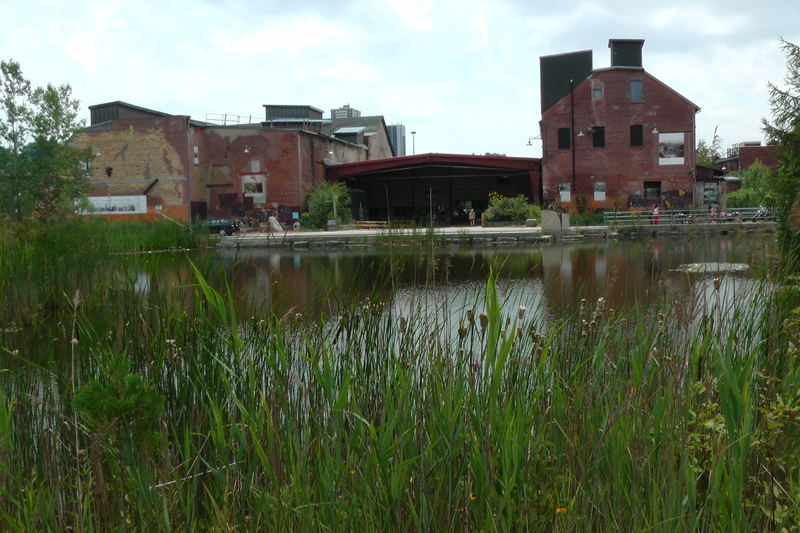 We took the scenic route out of Halifax, passing through the Salt Marsh and Shearwater Flyer trails. The trails are part of the Trans Canada Trail and are built on the old railbed. Birds love the salt marsh and you can see them feeding on small aquatic life. It’s also neat to see the tides rush through the narrow spots and into the shallow warm pools of the salt marsh. 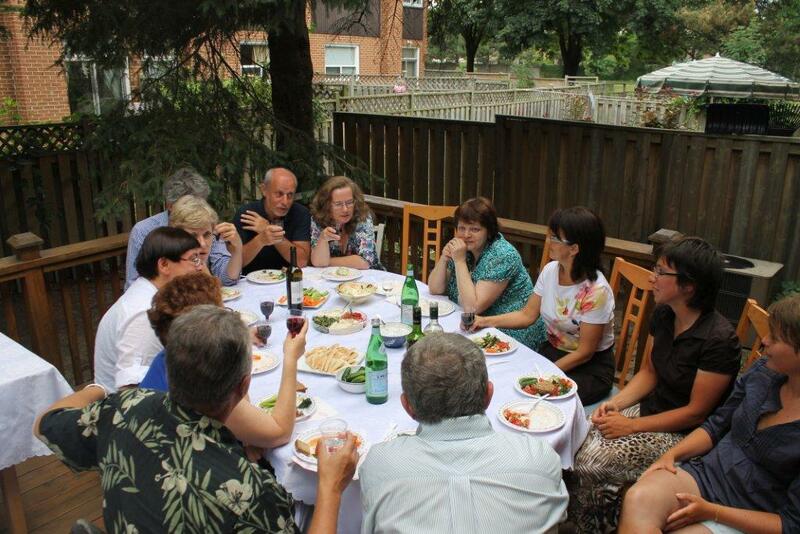 In Antigonish we stayed with the Ten Brinkes: Charlie, Ronny, and the kids. They’re actually a family of 5, it’s just part of their last name! Charlie is really energetic and inspiring lady who’s involved in everything. Between working at the university, getting the kids to hockey practice and such, cooking for the family, and acting with a dinner theatre troupe, she also does a tonne of sustainability stuff. The Ten Brinkes live just outside town, on a big beautiful piece of land. It hasn’t always been this nice: they built the house themselves and transformed the property from a rocky, rather barren field to a wooded area and garden. Charlie loves the trees and made a network of hiking trails for the kids. The wild critters love the trees too, and at one point Charlie had her yard certified with the Backyard Habitat Program. At the time, she ran a daycare where the kids could play around and connect with nature. 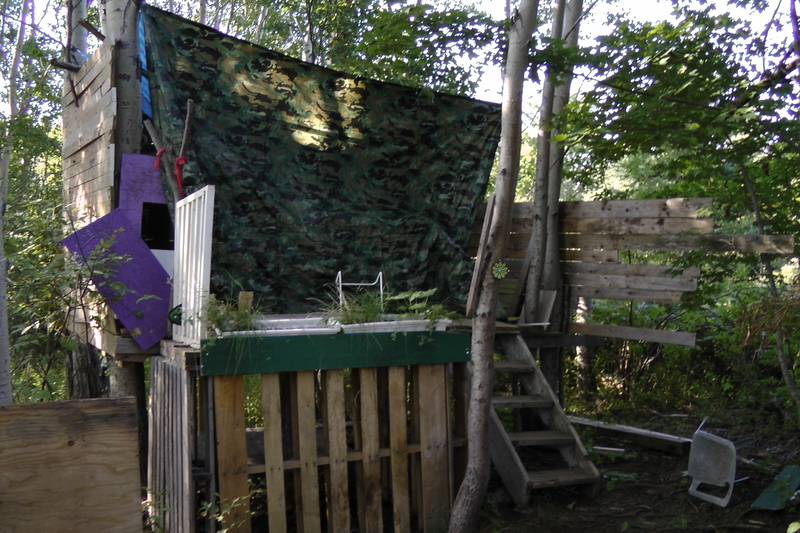 Her two boys, Jesse and Jamie, have a fort in the trees. Charlie helped them build it using recycled materials. Charlie also grows herbs and vegetables in her yard, to avoid the rising food prices. Feeding three kids is not cheap, especially if you want to give them fresh, organic vegetables. She also involves the kids in gardening. The two boys each have their own square of vegetable garden. At first, it was just a small patch, but this year they asked for a bigger area and now have a considerable garden plot each. Charlie says the boys feel very proud when the family eats vegetables from their garden plots. In Antigonish there is a small but dedicated group of people who organize various talks and events to promote sustainabiity. The group is great for exchanging ideas, but as Charlie tells us, they have trouble reaching out to the rest of the community and getting them to see the importance of moving towards a sustainable lifestyle. Case in point: Charlie and Ronny recently hosted a 200-person picnic and Charlie decided she wouldn’t use any single-use dishes. Yes, read that sentence again. 200 people. No plastic cups, plates, or anything. Let it sink in. Anyway, Charlie said that people were so used to disposable dishes and so unaware of what she was trying to do that some of them threw her dishes in the garbage. She had to fish through the garbage at the end of the event to get her dishes back. These are the challenges she and the Antigonish sustainability crowd is up against. With her kids, of course, it’s a different story: day in and day out, Charlie teaches them about recycling and not wasting water or electricity. Some days the kids still throw the compost in the garbage or leave the lights on in the entire house. But it’s not about getting it right each time, it’s about creating consciousness/awareness and instilling values. Charlie hopes to make the kids think about sustainability because she believes it’s important to their generation. 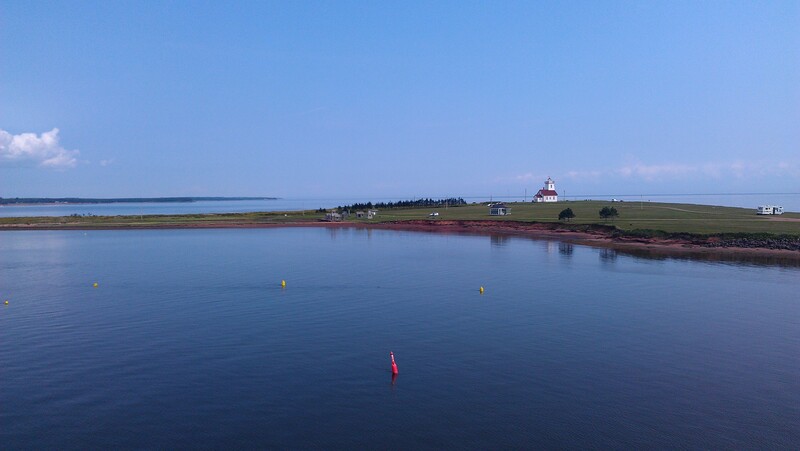 PEI is so small that the bridge to the island is bigger than the island itself! PEI is so small that if someone doesn’t know you, they’ll ask your last name because they probably know your relatives! Actually, this one’s not a joke. But it’s still funny! 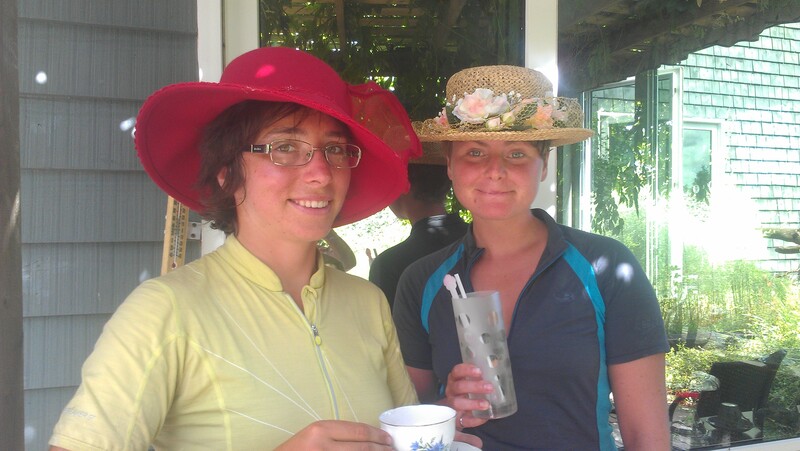 The tea room is conveniently situated just off the Confederation Trail, a cyclist’s paradise. It’s an impeccably-maintained gravel path, built atop the old railroad. It covers the entire island and is used by pedestrians, cyclists, and cross-country skiers in the wintertime. 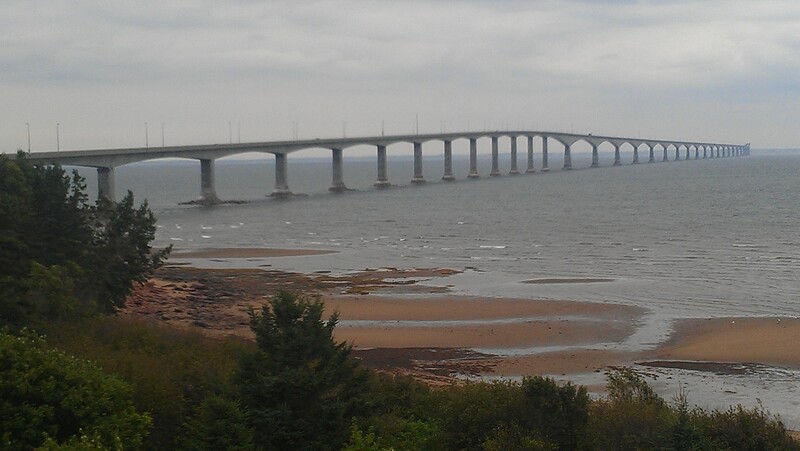 It inherits the convenient railroad grade, avoiding PEI’s many hills. On our first of two nights on the island, we couchsurfed with Sebastian and his mom, Marianne. 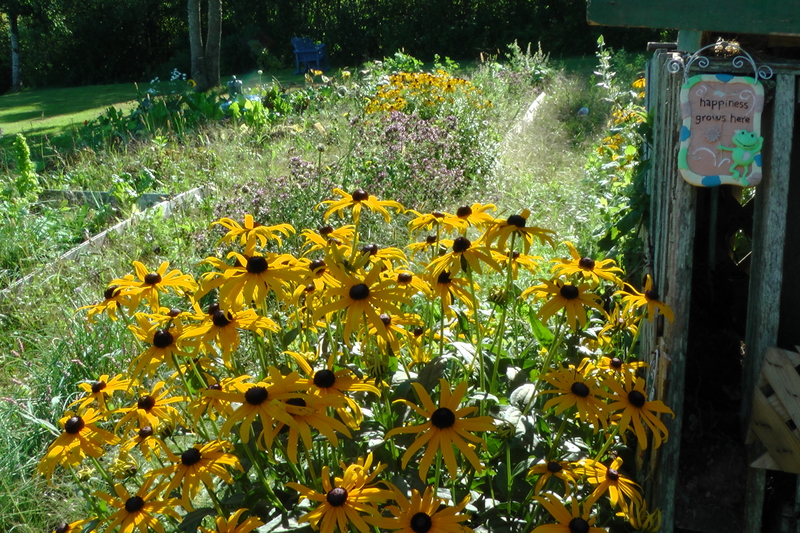 Marianne has an amazing food garden in her yard, as well as a chicken coop. She’s got two kinds of chickens: some for laying eggs and some for eating. We were there at just the right time: the chickens had just been slaughtered and we ate really fresh chicken for dinner. Marianne grows enough food for two and a half households. She does a lot of food preserving so that she has food from the garden through the winter months. This involves freezing the chickens and preserving a lot of the vegetables. Sebastian is in PEI for the summer working on an organic farm, but lives in Halifax for the rest of the year. He travels between Halifax and PEI a lot, but since he doesn’t have a car, he hitchhikes or takes the bus. However, the inter-provincial bus company providing service to the Maritime provinces, Acadian Bus Lines, will stop running this November. This will significantly limit the travel options between cities for people who do not own cars and will certainly increase traffic. Sebastian has also done tree-planting in New Brunswick and mentioned that a lot of forest there is owned by the Irvings. As Amanda told us earlier, in the Maritimes there are several powerful families with a lot of money who own a lot of land and businesses. The Irvings are one such family. They started out with just a few gas stations, but now they own most of the forests, mills, trucking companies, gas stations, and newspapers. Since the Irvings own the entirety of the newspaper business, from the raw material to production and distribution, it is difficult to get independent newspapers in these provinces. Of course, the Irving-owned news media is biased in reporting on Irving-owned industries. On our second day on the island, we visited Charlottetown. 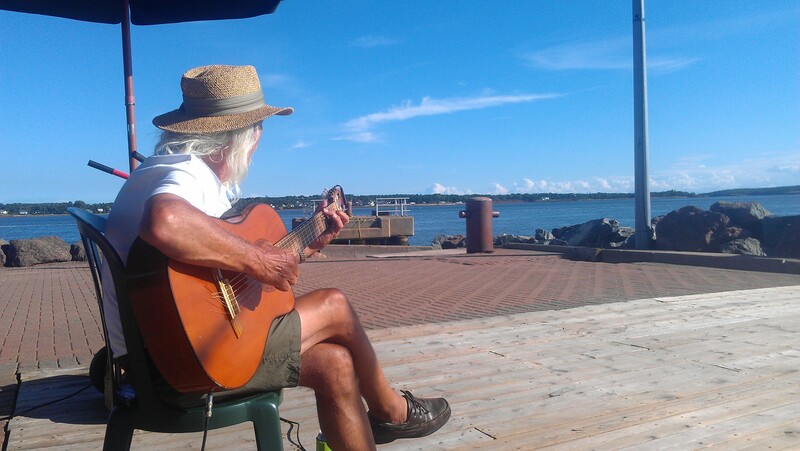 We met Guy, a guitarist from Montreal who comes to Charlottetown for the summer to busk. He asked us to watch his guitar and amp while he went to grab a snack. When he came back, he had some cool drinks for us. 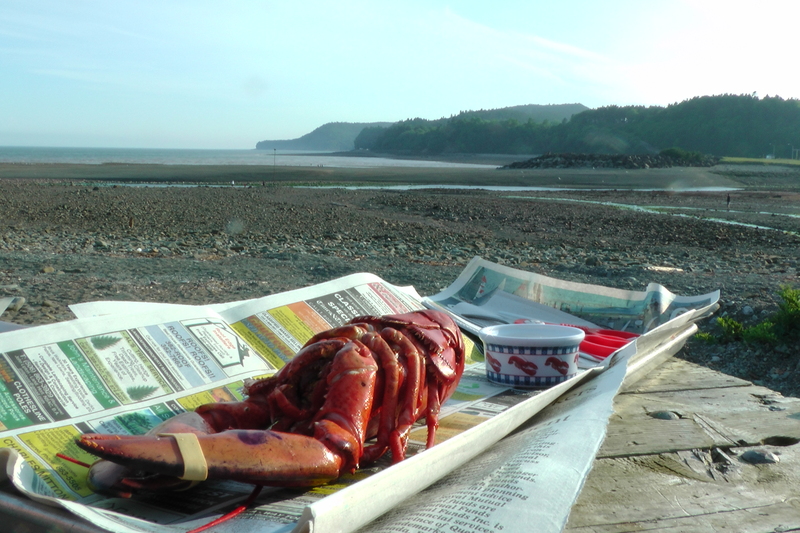 We ended up talking to him, sitting around for a few hours enjoying the sun and the sea. It all ended with Guy passing the guitar to Maria, and her classical tunes brought in some cash. Still got it! Tour de Sustainability’s team has temporarily increased in numbers. Amanda, one of the original team members, joined us for the weekend. As luck would have it, just then we hit three consecutive days of rain and headwind, after weeks and weeks of good weather. In 4 days Amanda covered 471km, without prior training — impressive! Stay tuned for her side of the story: she’ll be writing a guest entry in our blog. 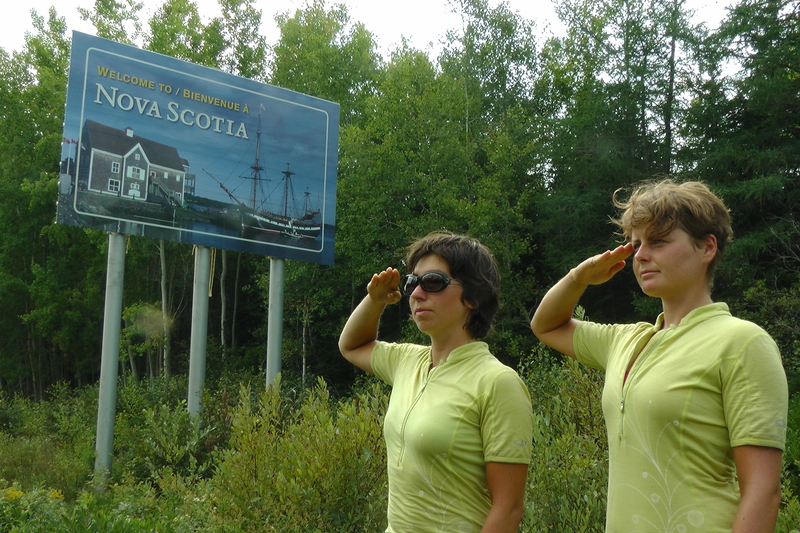 As we headed further south-east, towards Acadia, the French accents became less and less intelligible to our untrained ears. Thankfully, Amanda, who is New Brunswick born and raised, is bilingual. As our local tour guide she made sure we visited all the not-to-be-missed spots, and she also taught us how to eat this traditional NB snack food. Believe us, it requires a special skill. In Charlo we stopped for lunch in a quaint seaside restaurant called Le Moulin A Café. Amanda was very eager to get a copy of the paper, because she was supposed to be in it. By coincidence, the paper also had an article about the restaurant, as well as a bike event that we saw along the way! Talk about relevant news. 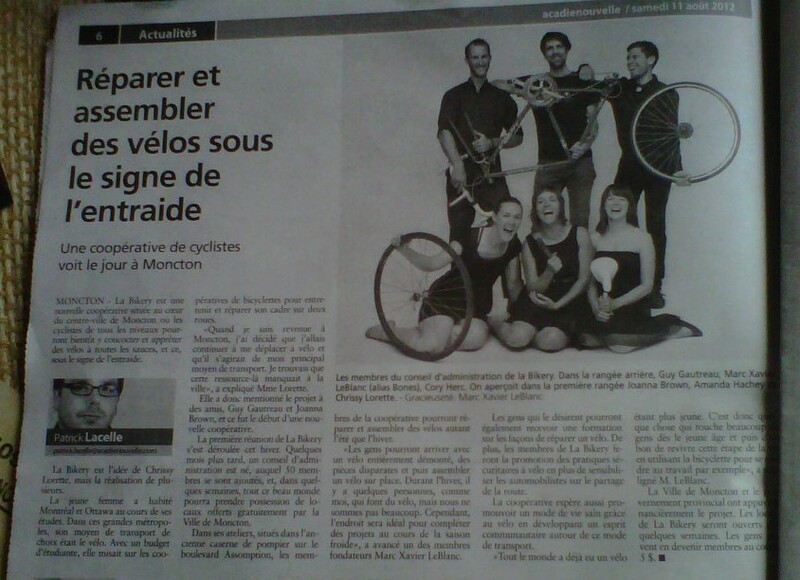 To translate and summarize: back in Moncton, Amanda and five others are opening a co-operatively owned bike shop, La Bikery. Members will have access to the shop and tools, a cheaper and more hands-on option for basic repairs and maintenance. This will make it easier for budget-conscious people to cycle more and let people practice their bike mechanics skills. La Bikery will also promote cycling culture in the Moncton area by putting on bike mechanics workshops and cycling events. 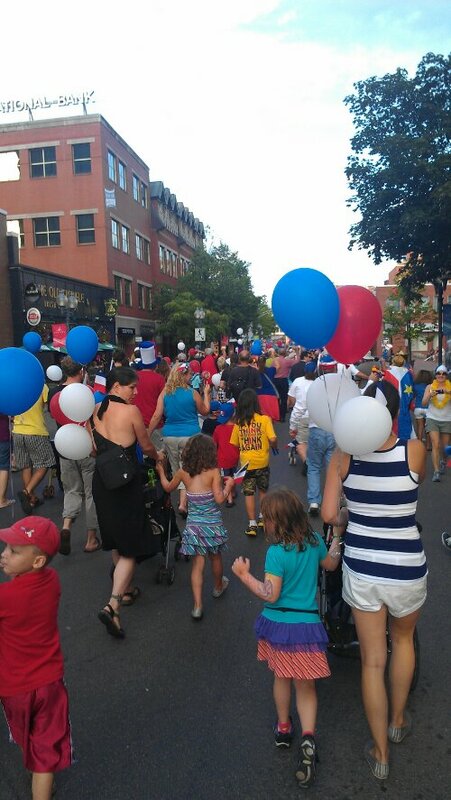 Our arrival in Moncton was timed just right for August 15 – La Fête Nationale D’Acadie! 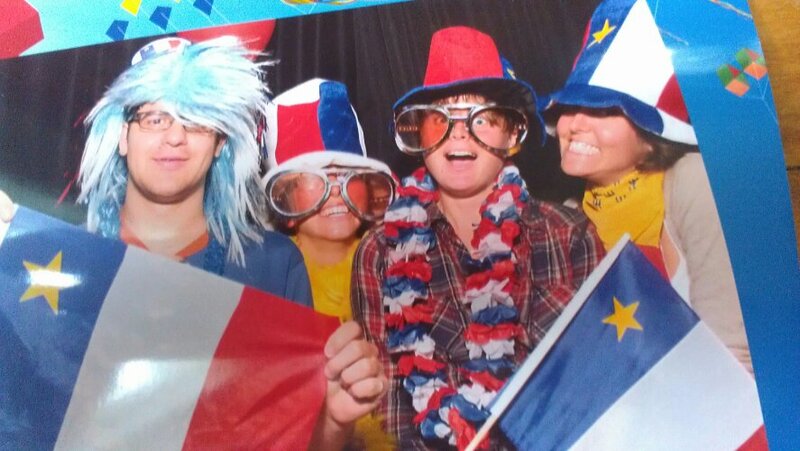 On this day, Acadians wave their flags and there is a parade called the Tintamarre, with everybody making lots of noise, whether it’s with the traditional pots and pans or some party noise toys from the dollar store. The Ottawa River, or la Riviere des Outaouais, separates Quebec and Ontario. There is a beautiful cycle path along its shores, extending about 30 km on either side of the capital. 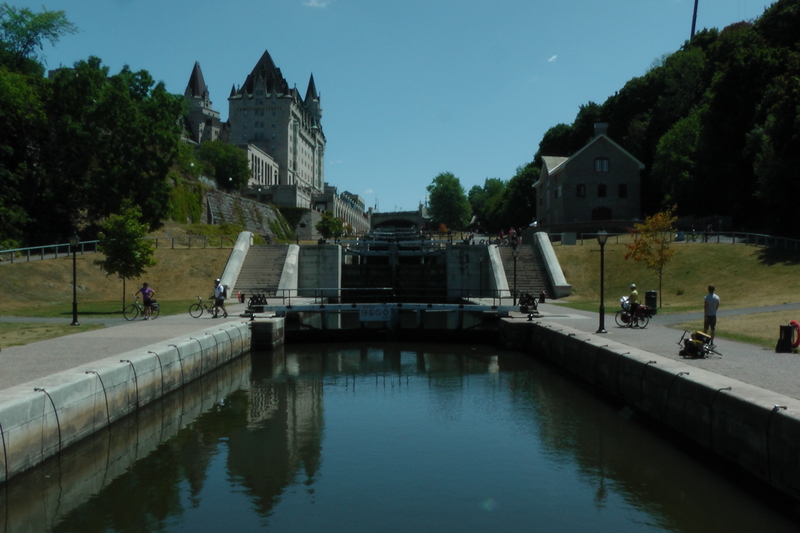 We were fortunate to bike into Ottawa on Sunday morning, when several waterfront streets are also closed to cars and open to bikes. The population on either side of the Ottawa River is a mix of francophones and anglophones, not correlating with provincial boundaries. The Frenchies are a proud people and the ones living in Ontario have their own Franco-Ontarian flag. They certainly have reason for patriotism. Our Warm Showers host, Pierre, stunned us with a four-course dinner with a wine pairing for each course. C’est ça la belle vie! Santé! We made it to Quebec, the land of poutine and bicycles. Canada’s belle province has a network of designated bike routes, called Routes Vertes, or green paths. Also, there is a designation for lodging and camping called Bienvenue Cyclistes (welcome cyclists) which essentially means that these places are bike-friendly; the campsites can always accommodate cyclists, even if they are fully booked! That’s part of the Route Verte we took into Montreal. Our final stretch was along the Lachine canal, and by that point it was already dark. It seemed like everyone was enjoying the warm summer night: lots of people were out for a stroll, and we even passed by an outdoor cha-cha lesson. It was an unusual time to be in Montreal: there were actually no festivals going on, except the fireworks, which are just like the ones in Vancouver. But that didn’t stop us from enjoying tourist classics such as street performances, cafes with patios, and cobblestone streets. 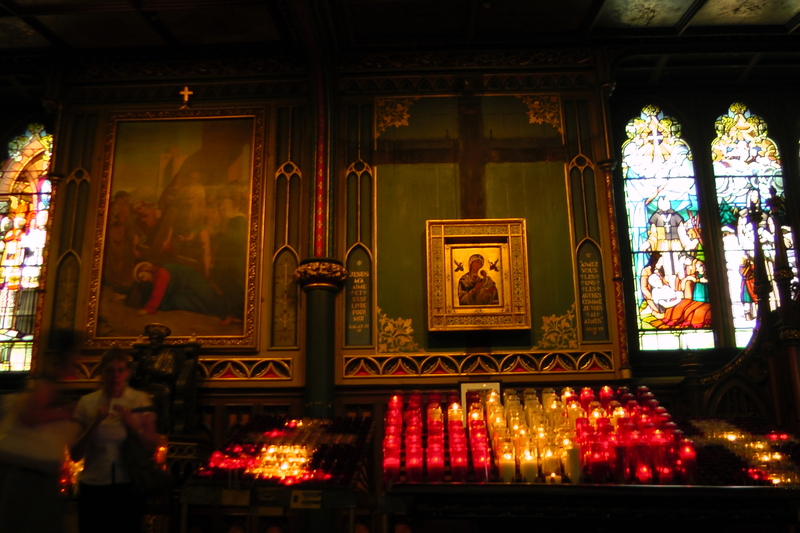 Although we’ve been to Montreal before and visited the Notre Dame basilica, it was definitely worth seeing again. Once past the initial hurdle of getting into the city, we were cordially greeted by Anya’s parents. Some of their friends were excited to hear about our journey, so they hosted a BBQ/storytelling session, so that we could be fed while recounting exaggerations about our cycle tour. One of the guests suggested that because of the second law of thermodynamics (entropy always increases), sustainability is a pipe dream akin to a perpetual motion machine. This theoretical limitation would not apply to the earth alone because energy can be exchanged between the earth and the rest of the universe. Then we are talking about the universe. But the fate of the universe is a hotly debated topic and perhaps it will be renewed in a big crunch followed by another big bang. Also, this is so far into the future that first, giant crabs will take over the world, then the sun will engulf half of the planets in our solar system, and only much much later can we anticipate the heat death of the universe. 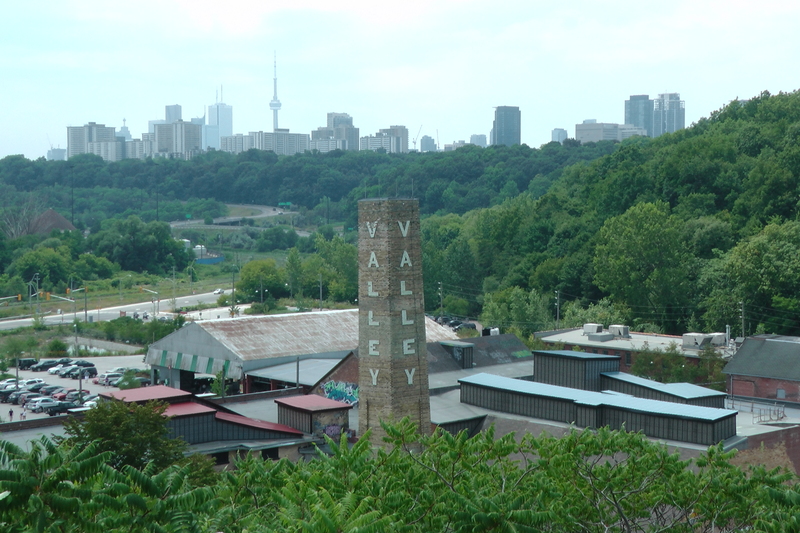 We also visited Evergreen Brick Works, where they had a fascinating exhibit called ‘MOVE‘ about transportation in Toronto. It was put together by Evergreen in collaboration with Institute Without Boundaries. It shows the history of transportation in Toronto, has cool data visualizations for current transportation stats, and suggests a whole host of ideas for how to make transportation more sustainable in the future. 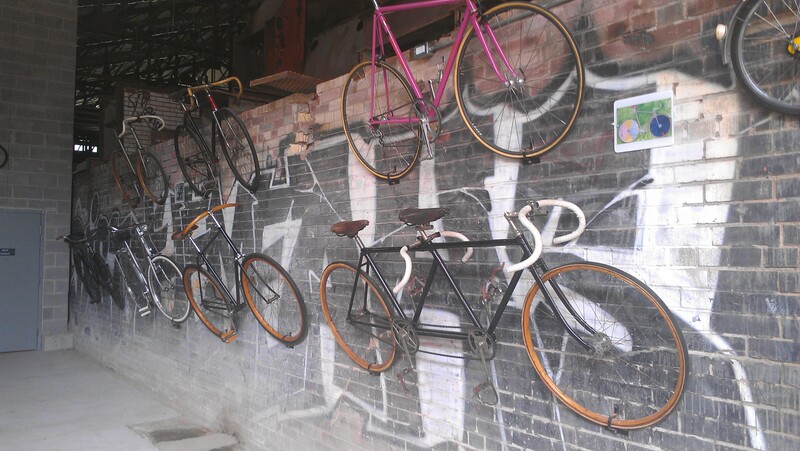 Here’s one amazing guy’s collection of bicycles, displayed as part of the MOVE exhibit. 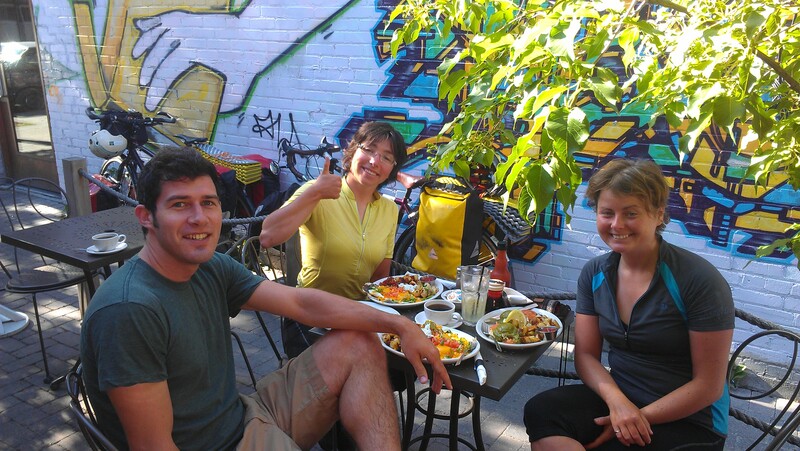 After biking 100km, what better way to spend the evening than to get a tour of Winnipeg – on bikes?! Yep! That’s what we did and we loved it. Our host, Aaron, told us he’d been a cycling tour guide in a past life. We got to see the architecture downtown, Assiniboine Park, the Flaming Trolleys band practicing in a square, a lone guy practicing banjo on his front porch, to name a few. Aaron loves cooking so we fired up the BBQ and had an amazing dinner at his place. We talked about green construction, city planning, and green campuses. Since he is studying at the University of Manitoba, Aaron was angry that he was studying in a place that was doing so little in terms of sustainability compared to other universities. He started several initiatives, in particular a campus composting program and the Sustainable Campus Student Group, that provides students with learning and networking opportunities in the Green Building industry. Initially, Aaron said, some people were reluctant to change and his initiatives were met with a lot of resistance. However, he saw things through until his goals were met, and those same people are now seeing that these initiatives were a good thing for everyone involved. He has also recently been recognized with an award from Canada Green Building Council (CaGBC) for his strategic plan to green the University of Manitoba campus. As if that were not enough work, Aaron also coordinates a weekly farmer’s market in Winnipeg. He said his strategy was to make the market hip and connect it to the local community. He invited local bands to come and play and said that the number of people coming to the market almost doubled from one year to the next. It was difficult to leave Winnipeg with its hipster cafes and music scene, but we had to move on. Before we knew it, we were officially halfway through the country. On our way to Falcon Lake we came across a fruit stand. Ah, fruit! Perhaps it is from Ontario? Nope… it’s from California and sometimes from BC. Money is no object for most of the customers, so it makes it worthwhile to truck in fruit from distant parts of the globe and pose as a peddler of local produce. The only local thing we found was the honey, and the Saskatoon jam. We purchased both items. 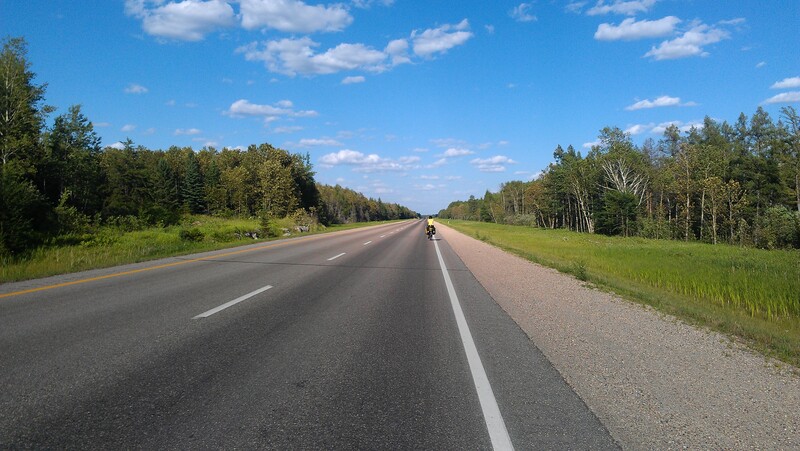 With a strong wind blowing at our backs, the 158km to Falcon Lake was a breeze. Our Falcon Lake host, Eric, welcomed us with tasty smoothies, a dip in the lake and yummy vegetarian dinner: quinoa buckwheat salad with broccoli, cheese, fresh basil, and an olive-balsamic dressing. We got to spend the night in a spacious screened porch. The porch is constructed using trees from the backyard, but the most notable part is the ceiling: an intricate tangle of tree roots forms an integral part of its structure. The roots are from a huge tree from Eric’s yard, uprooted during a storm. Eric’s brother designed the porch to showcase the impressive stump. Eric’s dad asked Maria whether she wears a bicycle helmet. Bike helmet laws are a hot topic in Manitoba: there is talk of making helmets mandatory. In BC, this is already the case, but bike helmet laws are also a hot topic there, because Vancouver is setting up a bike share program, and some people are concerned about how the current helmet laws will affect its success. Bicycle helmet laws are not a clear-cut issue: there is much controversy about it. Of course, some people will still choose to wear a helmet even if they are not legally bound to do so. As for Maria, she’s decided to try the helmet-free lifestyle in the provinces where it’s legal.